Volume III of the Spirituality in Religious Education series bring together textual, empirical and pedagogical approaches to enriching spiritual education as a significant multi-disciplinary and cross-curricular influence in the modern world. The chapters presented have been selected from international contributions presented at the Third International Conference on Spiritual Education. The writers include prominent international researchers in the discipline from the UK, the United States, Canada, Australia and China. The strengths of the book lie in its international appeal, research-based orientation, and interdisciplinary character. 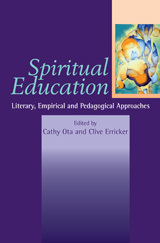 This book furthers the presentation of spiritual education as a distinctive field of academic enquiry in its own right. 13 The Spiritual Dimension of the Curriculum: What are school inspectors looking for and how can we help them find it?